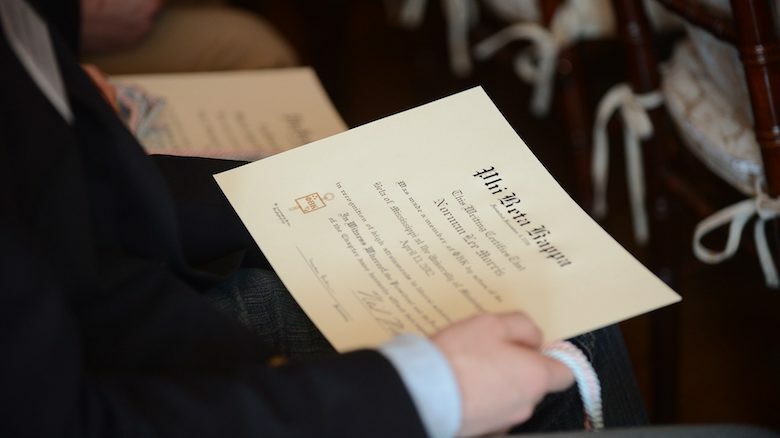 The University of Mississippi chapter of Phi Beta Kappa honor society has been recognized as one of two outstanding chapters nationwide administered at a public university. A Certificate of Recognition is given to just six “outstanding chapters” nationally every three years: two public universities, two private universities and two liberal arts colleges. Only 10 percent of U.S. colleges and universities shelter PBK chapters. Officers of the UM chapter attribute the award to high levels of faculty participation, as well as a strong website. “Receiving this certificate, being honored as an outstanding chapter of Phi Beta Kappa, really shows how great a job our chapter is doing,” said Luanne Buchanan, instructional associate professor of Spanish who serves as the chapter’s secretary and treasurer. Sandra Spiroff, associate professor of mathematics who serves as the chapter’s president, echoed Buchanan’s statement. Schenck, retiring president of the UM chapter who was on hand to receive the award in August at Phi Beta Kappa’s Triennial Council, said he was pleasantly surprised by the honor. Phi Beta Kappa, the country’s oldest undergraduate honors organization, was founded in 1776 at the College of William and Mary in Virginia. Since 2001, UM has been home to the organization’s Beta of Mississippi chapter. Students cannot apply for membership; instead, they are identified by faculty for nomination based on their outstanding academic records in liberal arts classes.